Period Architecture Ltd. designs a gourmet kitchen with revolutionary flair. 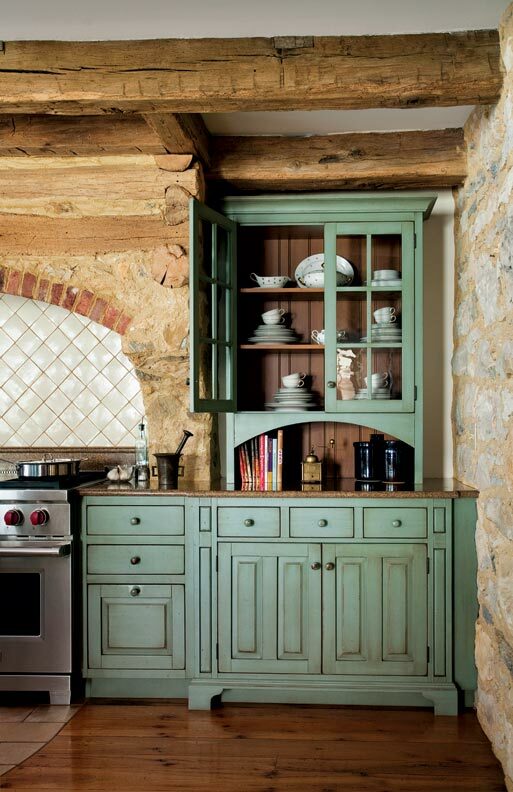 Rough-hewn beams and muted, colonial-inspired green create a classic kitchen feel in this Pennsylvania farmhouse. When the 18th-century woman of the house prepared dinner at Cold Spring Farm, she would have turned to the stone fireplace. There, she may have cooked a stew in the cauldron or baked the meal in the hearth below. 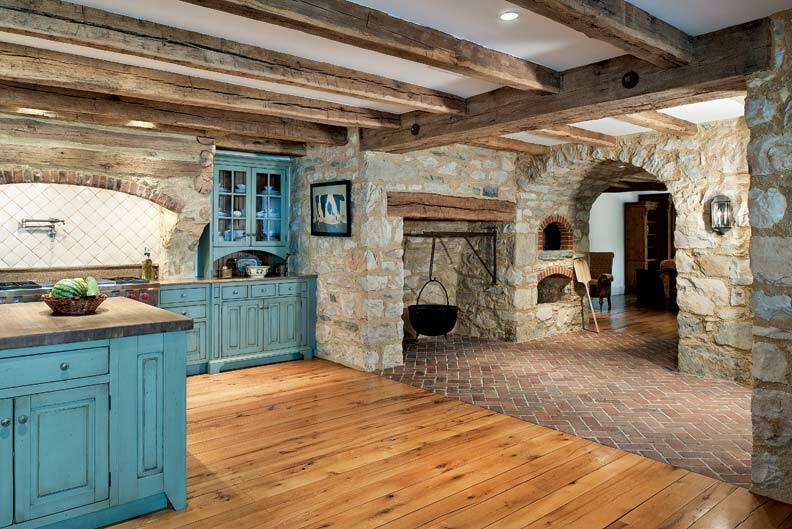 The current owner of the limestone farmhouse, perched on a rise in the countryside west of Philadelphia, might use the home’s enormous stone fireplace—which he built himself—or choose the wood-fired pizza oven that sits next to it. 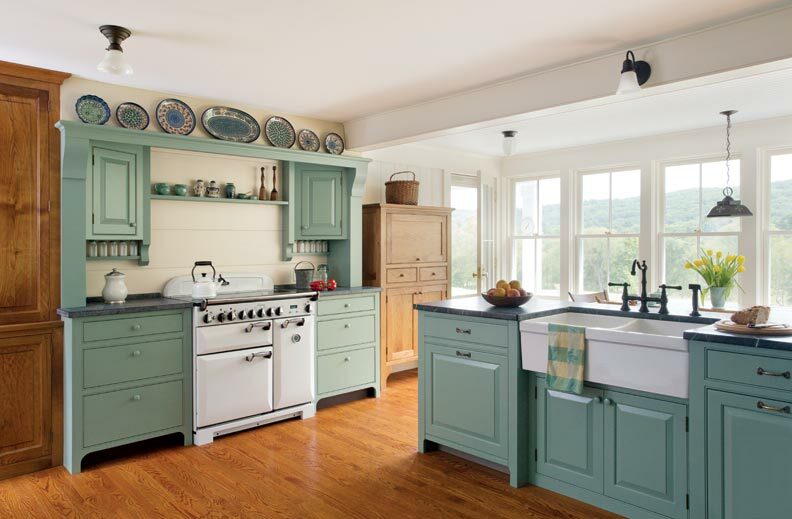 With its pitch-perfect blend of historic and modern, the kitchen at Cold Spring Farm has achieved a delicate balance. While top-of-the-line appliances do the work demanded of them, the home’s interior, with its salvaged exposed beams, burnished wood, and thick plaster walls, sets a sedate tone. The cabinets are finished in a distressed milk paint. At Cold Spring Farm in the 1700s, Mancuso says, the kitchen was a completely different space, a hard-working area situated around the large fireplace, with food storage inside furniture and on open shelves. But old or new, homes traditionally draw people at the end of the day, and today more than ever, kitchens are the symbolic and literal hearth. 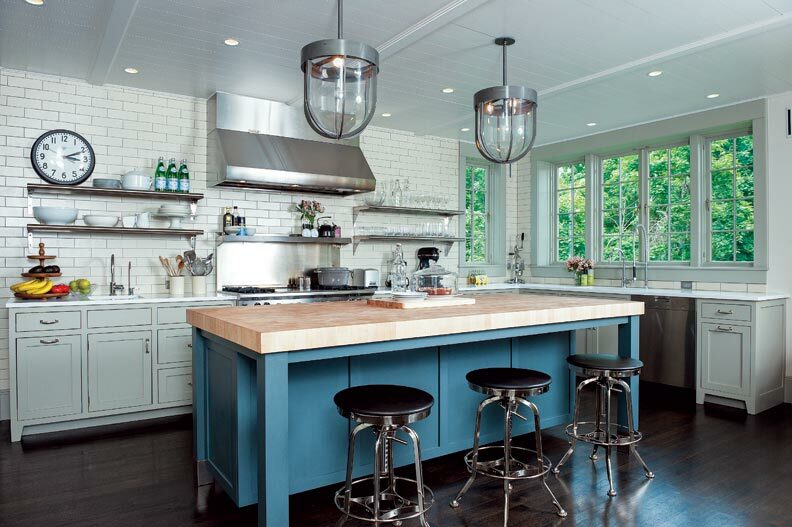 “Kitchens have evolved into the heart of the home, sort of command central,” Mancuso says. Cold Spring Farm’s kitchen, visible from the home’s front entrance, is roomy and welcoming. 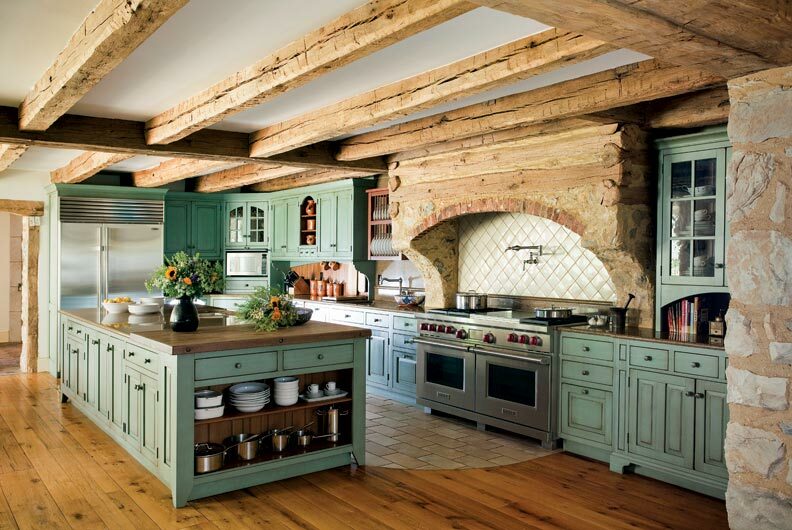 Warm wood—from the massive timber beams to the reclaimed white oak floor and stone-and-log structure that disguises the range hood—sets a welcoming tone against the blue-green cabinetry by Premier Custom Built Inc. in New Holland, Pennsylvania. 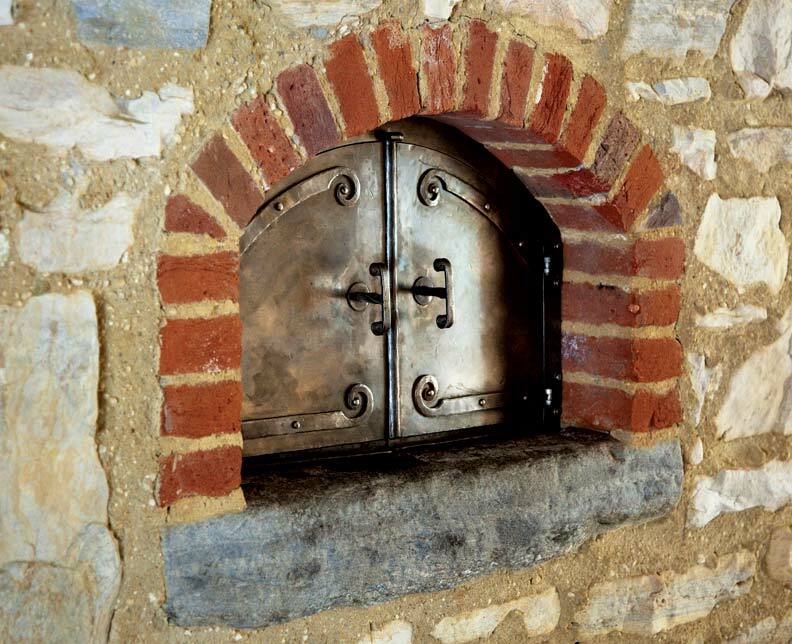 Copper doors on the beehive oven offer a warm patina to the space. When Mancuso approached the 21&apos; x 26&apos; kitchen, in a newly built area of the home, he knew it required minimal work triangles and thoughtful solutions for storage. 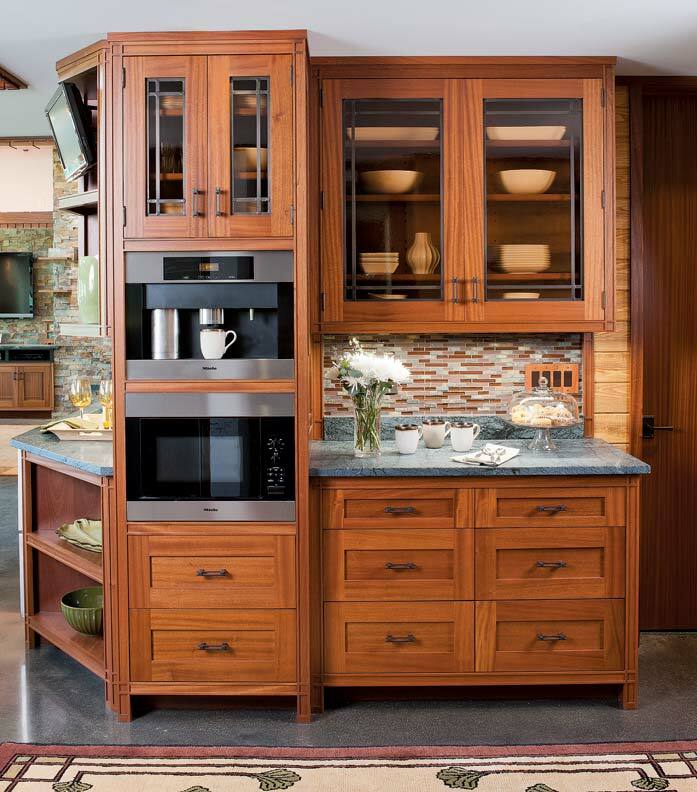 The island also required attention: Would it be strictly for work, storage, or seating? Mancuso and the European owner, a stonemason, set their priorities. While family and guests may sit at the oak table, handmade for the room and set away from the kitchen’s work area, they often linger around those who are preparing dinner. There is no seating at the island—topped with granite, as are the perimeter countertops—but plenty of storage on all four sides, as well as a prep sink and butcher-block top. Integrating modern appliances into a historic space was, Mancuso says, “a huge challenge,” which the team met by allowing some necessities to take center stage and hiding others in cabinetry with the look of fine furniture. A modern 60" Wolf range equipped with a pot filler—a cold-water faucet on the wall above—is work central. Nearby is a stainless steel Sub-Zero refrigerator. Minor items, such as the microwave and trash compartment, are behind hideaway panels. The room’s work area is built against a hill, located in a wing that Mancuso and his partners added to the existing house during the renovation. “This yielded the most storage and the best workable area, without having to deal with door and window openings,” Mancuso says. Opposite the prep-and-cook section is a wall of windows, spilling light on the family dining table, shining the already burnished wood, and balancing new and old with a light, airy feel. Taking cues from the Prairie style, architect Michael Rust and cabinet designer Fred Puksta collaborate to create a dreamy new kitchen. Architect Sandra Vitzthum designs a welcoming, functional kitchen for a Connecticut family. Fivecat Studio combines traditional and contemporary touches for a timeless, transitional kitchen in New York.